It is not a simple task for normal folks not trained in identifying rugs to know the distinction between an authentic handmade Oriental rug and a machine-made rug. Handwoven and hand knotted rugs are also known as Oriental rugs and are mostly collectibles due to their quality. The quality of Oriental rugs hugely depends on the yarns’ quality, dyes used and knot count among other factors. 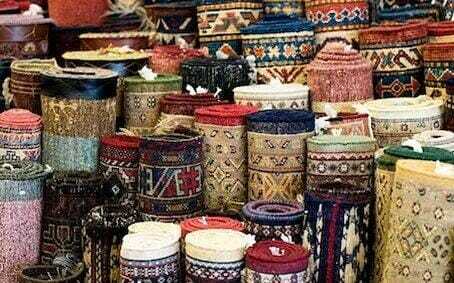 You will find rugs knotted by hand are made through a loom specially designed and knotted through the use of the hand. Hand knotted oriental rugs have been made for centuries through an ancient art that can only be admired. 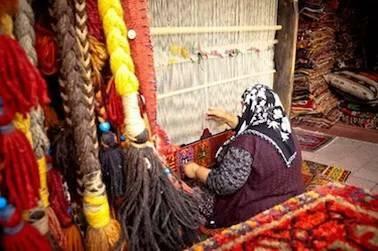 The loom’s size depends on the rug’s size with the weaving carried out moving from the bottom going up to the top. The weaver of the rug usually interweaves the “knots” into the rug’s groundwork, which are hand tied, something that makes the rug’s pile. It is a very time consuming and a tedious operation. It is also easy to note some slight changes in color that make thin or thick stripes when it comes to a handmade rug. Such is the result of dyes used to change the wool during weaving or just the way the wool’s colors age due to the atmosphere, light, and washing. Most of the color changes can be seen in the rug’s background color known as abrash. It is hard to find such circumstances in rugs made by machines. It is worth noting handmade rugs in most cases have wool pile used to weave them. A rug made by a machine is mostly made through the use of a polyester or nylon pile while weaving is very uniform and close. Also for any authentic Oriental rug, on the rug’s back, you will find white thread weaves from one end of the fringe to the other called the warp. There is always a very strong difference between a handmade and machine-made rug visually. This is apparent especially on the back of a machine-made rug which is very distinct in terms of appearance to a handmade rug’s back. 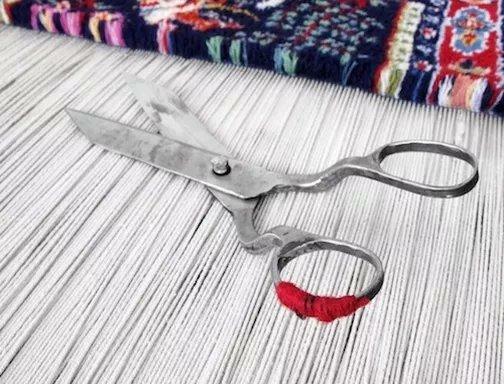 You will find the design of the machine-made rug’s back not as colorful as the back of the hand-woven Oriental rug. While the machine-made rug has its edges machine overstitched and a fringe applied, the handmade Oriental rug’s fringe runs throughout the length of the rug which is called the warp. The machine-made rug has overstitch patterns running across its back and distinguishing individual knots appearing on the back are not easy to find. 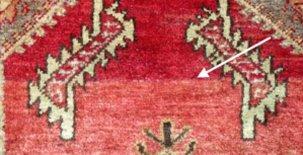 In fact, for the machine-made rug, the overstitch construction is generally what keeps the pile material held together. This means that the fringe is applied on a machine-made rug once it has been completed while the hand-woven Oriental rug has its fringe as a part of warp strings as they leave the handmade rug’s end. You can turn towards the front part of the rug and peruse the designs intently. Essentially, the design should never be of the same shape and size from one opposite end to the other end of the potentially handmade Oriental rug. Also, the design patterns will not always be perfect either. This unevenness is something that is clear in most Oriental rugs that are much older and is a sign of authenticity and should not be mistaken for a poorly done rug. Machine-made rugs usually contain same pattern sizes all around and variations are not really visible. However, machine-made imitations do have uneven patterns but this is less common. The price of the Oriental rug and machine-made rugs differ a lot. While an Oriental rug is very expensive but more durable, a machine-made rug costs much less and is an alternative to expensive hand knotted or hand-woven rugs. There are rug salesmen all over the world however that will try to sell rugs made from a cheaper material like Rayon or a blend of chemically altered and/or manufactured fibers. They will have the rugs priced as if they were made of silk. Beware! A real silk rug should have real silk fringe that is clearly an extension of the rug’s structure, not sewn on or sewn into the ends of the rug. Countries of origin like Persia, India, China, Egypt, and Afghanistan, do offer handmade Oriental rugs at a fraction of the price at which they are offered in Canada and other parts of North America. So, it may be worth it to travel to those countries if you are interested in purchasing a quality handmade Oriental rug. If you are having any trouble identifying an Oriental rug from a man-made one, you can always turn to a trustworthy expert for help. A professional rug cleaner like Bebirian Rugs, will have extensive knowledge in this subject. We hope this article answered some of the questions you had about identifying authentic handmade Oriental rugs and helped you make better decisions with rug purchases.